Writers are often told: "Write what you know." So when I decided to write and direct my own spec commercial, I wrestled with what product or service I would be 'selling'. Since it's a spec commercial, would I create a fake product? Pretty vague advice. I had previously written political PSAs that were topical to current events but have since become dated as it so often happens with the news. So I decided to get inspiration for a commercial by watching other TV commercials. With remote in hand, and as strange as it sounds, I channel surfed, looking for commercials. There were some cute ones, funny ones and some that I couldn't identify what the product was (not sure if that was effective). Then I saw a familiar one: A Manulife commercial where my 7-year-old daughter plays a dentist. The idea was that our kids, doing grown-up jobs, shouldn't have to take care of us. My daughter wasn't originally supposed to have a line but the director asked her if she could and she willingly took the challenge. I recalled the shoot when I sat watching the monitors with the crew, producers and the advertising client. One of them leaned over to me and whispered, "Your daughter is terrific. She is very professional and has a lot of self-confidence for someone her age." It was nice to hear, as it was something that my wife and I strive for with both our kids. It was something I felt strongly about because my own upbringing was very different. 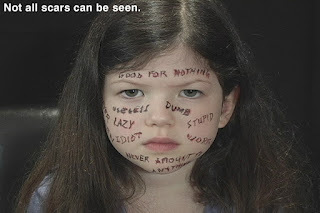 My daughter has never been told she was 'worthless', 'an idot', 'lazy', 'stupid', 'good for nothing' or 'retarded'. Never has she heard her parent say, "I wish you had never been born." These were words that were said to me when I was her age. Throughout my childhood there were other beatings. I was slapped, punched, thrown down the stairs and attacked with a lit cigarette. I was threatened that, if I called the police, I would end up in the hospital with every bone broken in my body. Several decades later, the physical hits are distant memories, and the scars on my chest from the cigarettes are just small marks, but despite my successes with writing and directing, I can still feel the sting of those words. I took those stinging words and put them down on paper. Five mintues later, I had my spec script written. I decided to cast my daughter in the commercial because she had enough stage and screen experience that I knew she would give the performance I was looking for, even if she didn't understand the subject. I asked an actor-friend to record the 'angry parent voice over', and filmed it in one evening. Post-production took a bit longer (once you watch the commercial, you'll understand why) and I had to take some time off, as my daughter was cast in a Hallmark TV movie for which we flew out to Halifax. She and I had a great time together and every time I see her smiling face, I'm glad she doesn't have my inner scars. Proof that the cycle of abuse can stop.